The Cordillera Blanca in the Callejón de Huaylas (407km northeast from Lima), is the highest mountain range in the Peruvian Andes. It is unique; containing glaciers, lakes, and tropical flora/fauna, and is also notable for anthropological and cultural interest. Combined with the relative accessibility of the range, these conditions promote both recreational tourism and adventure. 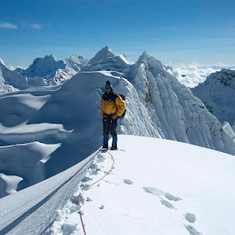 Over 180km long, this range is the most frequented by Peruvian and foreign climbers, with 30 peaks aver 6,000 meters. It possesses a variety of peaks of irresistible appeal, including Alpamayo, cataloged by a global survey of scenic beauty of Munich Germany in 1966 as the most beautiful mountain in the world. In addition to mountain climbing, visitors can opt for adventure sports such as trekking, canoeing, hang gliding, mountain biking, and skiing. The Rio Santa, famous for boating and kayaking, runs through amazing natural formations to create spectacular runs. The pituresque villages that lie along the ridge width are also easily accessible by car and walking.